Hatters boss Nathan Jones was eager to wax lyrical about his side after they produced a magnificent performance to see off Crawley Town 4-1 at Kenilworth Road last night. Going into the game, the visitors had been on a fine run of form, winning their last four matches, and picking up seven wins from eight matches. However, they were simply blown away at times by a Luton side who maintained their six point lead at the summit in some style. Jones said: “Some of the football was just breathtaking at times. We needed the goal and had a little bit of luck with the goal, we hit the post, they hit the post to be fair with their only chance and then I thought we were excellent. “I’m not being arrogant or boastful, but I’m proud of that and I’m going to wax lyrical about it because it’s a wonderful, wonderful performance, it really was. 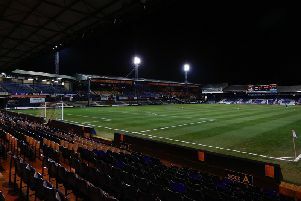 Striker James Collins netted twice against his former club in each half, while Olly Lee and Luke Berry were also on target, although it could easily have been double figures on the night, such was Luton’s dominance. Jones continued: “That was absolutely outstanding and to be honest with you, it should have been a lot, lot more. “We were better tonight than when we won eight and seven, we were outstanding. “Some of the football we played, I haven't got adjectives to say, but I’m so proud of them, so proud of them. “They look to play, they have a structure and it’s difficult, how they want to play, but we went out, we got at them, we pressed them, we stopped them playing and some of the stuff we played was different gear. “I wouldn't like to see the stats, but the possession stats, the chances, that was as convincing as I've ever seen. "A lot has been said about us, a lot of things. That was as good as, I haven’t got adjectives to say it because I thought we were outstanding from start to finish. Collins himself could have easily had a hat-trick, as he missed a hatful of opportunities, while Harry Cornick was denied by keeper Glenn Morris on a number of occasions, as was Lee. Jones said: “The chances he’s (Collins) had, the header he’s had first half. I’m not even going to mention the fact it would flatter us as we should have been double that today with the clarity of chances we had and the way we went about our work. “I’m just pleased, I wanted to win today, we needed a win, especially after the disappointment of Stevenage and conceding. Jones made two changes for the clash bringing in Andrew Shinnie and reverting to the diamond formation, while James Justin replaced the suspended Dan Potts at left back, as the boss added: “It would wrong to single anyone out as I thought the back four defended superbly well. “We had to make a change with James Justin coming in, but he was outstanding, we handled every threat they had. “Flynn Downes once again showed a masterclass from a defensive midfield player in there and our front two were a constant threat in different ways. “If we could just get Harry Cornick finishing, wow, some kid. “They came here to win the game though, fair play to them, they were positive, they picked a front three who are out and out pace, so we knew that they were a threat.